There are two issues that are guaranteed to mobilise the moralistic masses out of their social justice torpor: homosexuality and abortion. Recently, Australia saw these self-appointed guardians of morality taking time out from their bible studies and prayer groups where social justice is a dirty word, so they could attack marriage equality and bully LGBTIQ+ people while attacking anti-bullying programs such as Safe Schools. It's a pity these guardians of morality don't get as upset about the human rights abuses meted out by the Australian government as they do about people having the choice to marry whom they chose. But abortion. The other moralistic meat. It is fodder to the self-righteousness of the pro-lifers ... or, more accurately, anti-abortionists ... because their idea of pro-life ends with birth as you will soon see. These anti-abortionists clapped and cheered and waved their flags when President Donald Trump stated he was going to cease funding health care providers around the world, if they gave advice about or provided abortions, even though evidence indicates an increase in backyard abortions when these programs are de-funded(1) and abortion is outlawed(2). Many of the anti-abortion brigade are Christians who will quote the bible as evidence of why abortion is bad. These are mainly scriptures about being formed in the womb, such as Psalm 139:13, 'For you created my in most being, you knit me together in my mother's womb', and Psalm 22:10, 'From birth I was cast on you; from my mother's womb you have been my God'. This scriptures are used by some Christians to argue that human life starts at conception, however, none of them address abortion - either in prohibiting it or in addressing the causes of abortion. Anti-abortion Christians, often miss some critical scriptures; some to do with the horrid treatment of babies in the bible and some to do with reducing unwanted pregnancies and abortion. Firstly, the bible has some terrible examples of the treatment of children and babies. For instance, 1 Samuel 15:3 is one of many scriptures that advocates killing every man, woman and child. Psalm 137:9 really sets the scene by declaring, 'happy is the one who seizes your infants and dashes them against rocks'. I can't remember Dr James Dobson ever recommending this as an effective child-rearing technique, so hopefully no-one takes this scripture literally. As an interesting aside, that verse is in the same psalm that gave us the awesome Boney M song from the 1970s, Rivers of Babylon ... but I digress. Numbers 5:11-31 prescribes abortion for unfaithful wives, or for wives whose husbands are jealous and merely suspect the wife of infidelity (even if the wife has committed no wrongdoing). (3) Verses 30 & 31 state 'when the spirit of jealousy comes upon a man, and he becomes jealous of his wife; then he shall stand the woman before the Lord, and the priest shall execute all this law upon her. Then the man shall be free from iniquity, but that woman shall bear her guilt'. Note, these verses are printed in full at the bottom of this article. SO according to this scripture, if a man is jealous it is all the woman's fault (regardless of whether he has cause or not) and he can force her to have an abortion just because he is jealous - or at least drink poison that will mess up her ability to have kids if she isn't pregnant. She drinks the poison and if she cheated and is pregnant, she will have an abortion. What if she is pregnant to her husband and hasn't cheated? Are we to expect the magic potion can tell the difference? The abortion will happen anyway. The victims here are the wife and the fetus. The man gets away scot free for being unable to keep a lid on his jealousy. Sticking with songs of the 1970s, it's fortunate that John Lennon wasn't an advocate of this scripture ... he even wrote a song about being a Jealous Guy. Poor old Yoko could have found herself in a world of pain. Numbers 5:11-31 applies to the woman's alleged infidelity. But what of the man's infidelity? This isn't a one off. Centuries later, Jesus rescues a woman who was about to be stoned for adultery. As it takes at least two to tango, where was the man with whom the woman allegedly committed this indiscretion? The society of the day was particularly paternalistic and gave women fewer rights than men. Perhaps referencing the values of such a patriarchal society is not the best thing when discussing a woman's choice to decide whether or not to have an abortion. And then there's Hosea 13:16 which takes abortion, raises it to murder and then knocks it completely out of the park with 'Their infants shall be dashed in pieces, And their women with child ripped open'. This was a result of the hapless Samaria disobeying God. This disobedience thing comes at a high cost. Hosea 9:16, 'were they to bear children, I would kill the darlings of their womb'. Hmm ... forced abortion ... abortion is murder according to the anti-abortionists. If one wishes to be anti-abortion, then clearly the bible is not the hallmark to use for defending the fetus. Given the extremely patriarchal society described in the bible, it should not be used to justify legislation that affects a woman's right to chose what happens to her body. Women should have the right to chose whether or not they get an abortion. Not the church, not the self-appointed guardians of morality who will picket an abortion clinic while thanking God for a conservative government with the fortitude to torture and abuse asylum seekers fleeing persecution and war. It is understandable that some people find abortion abhorrent and wish to stop it, after all, the fetus represents the potential for a life. But with backyard abortion rates increasing when abortion is banned, the so-called pro-life lobby needs to re-calibrate their position and look to the drivers of abortion if they truly want to stop it. One of the main drivers of abortion is poverty, which affects the ability for people to afford contraception, thus increasing unwanted pregnancies, as well as the difficulty in meeting the cost of raising children; all of which contribute to an increased rate of abortion for poorer people(4). It's interesting that many of the pro-life brigade are also opposed to welfare, increasing the minimum wage and penalty rates, Obamacare (or universal healthcare) and cheered on Trump's cuts to funding of programs across the globe that provided contraception and advice on safe abortions: all things that reduce the incidence of unwanted pregnancy, abortion and backyard abortions, thus resulting in fewer terminations and saving the lives of countless women. 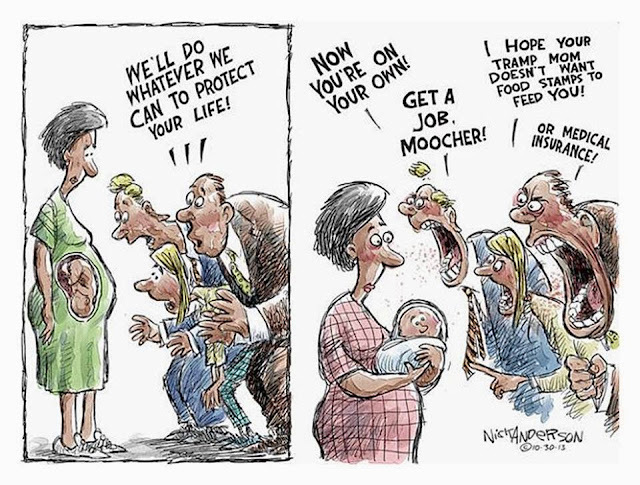 In fact, most of the pro-lifers aren't interested in the child once it's born. Instead of calling themselves 'pro-life', they should call themselves 'pro-birth', because that is where their concern ends. 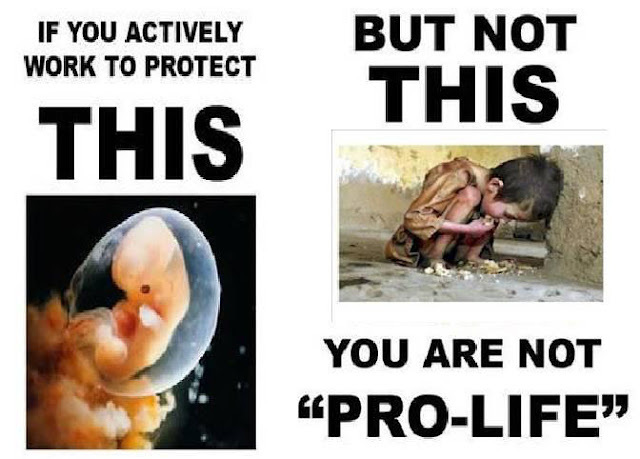 Anti-abortionists are more concerned with arguing when life begins than in protecting life once it's born. Anti-abortionists focus on banning abortion even though the evidence shows this is ineffective. Banning it is quick and easy, but drives it underground and makes the anti-abortionists feel like they are doing something. As long as they can't see it, anti-abortionists are happy. Out of sight, out of mind. So they're not really anti-abortion, they are anti-legal-abortion. If they really wanted to do something they would address the causes of abortion, not sweep it under the carpet. Addressing the causes is more difficult than simply banning it. It's interesting that so many 'pro-lifers' reference the bible to support their anti-abortion stance, but ignore the scriptures that would actually reduce unwanted pregnancies and abortions. No, not the scriptures about remaining celibate! You know the scriptures. They're the ones that tell us to care for the poor, the widow, the orphan. Yet the moment that the government puts forward programs to do just that, these uber-religious types start looking for a socialist to crucify ... something like they did with Jesus a couple of millenia ago. It's ironic that the only scriptures of the bible that will help reduce poverty and homelessness, and therefore reduce unwanted pregnancies and abortion, are the scriptures most often ignored by anti-abortion Christians. 1. World Health Organization, Eran Bendavid, Patrick Avila, Grant Miller, United States aid policy and induced abortion in Sub-Sahara Africa, 27 September 2011, http://www.who.int/bulletin/volumes/89/12/11-091660/en/. Accessed 28 December 2017. 2. The American Prospect, Nathalie Baptiste, This is What Happens When Abortion is Outlawed, 17 June 2015, http://prospect.org/article/what-happens-when-abortion-outlawed. Accessed 28 December 2017. 3. Bergant, D. and Karris, R., (1992). The Collegeville Bible Commentary: Old and New Testament Set. Liturgical Press, p. 156. 4. Guttmacher Institute, Heather D. Boonstra, Abortion in the Lives of Women Struggling Financially: Why Insurance Coverage Matters, 14 July 2016, https://www.guttmacher.org/gpr/2016/07/abortion-lives-women-struggling-financially-why-insurance-coverage-matters. Accessed 28 December 2017.